Let me tell you about a finger lickin' little spot; if you enjoy Jamaican cuisine and rum, you'll be one very happy camper in Rum Kitchen. There are a couple of Rum Kitchen restaurants in London, and I'm a real fan, so I thought I'd show you why I like it so much. Sharna and I rocked up at Rum Kitchen about 3pm on a Saturday and got a table straight away (thank god as this place gets busy!) and sat and nattered over some drinks whilst waiting for Ed to arrive. Sharna went for a rum and passion fruit cocktail, but you know me, rum and Ginger Beer is my tipple of choice at the moment and they offered me a million and one choices of rum. Between you and I, I don't know my rums, I just know that I enjoy dark rum best, so that's what I asked the guy for. He gave me Blackwell Rum, his own personal favourite, which was delicious. The great thing about this place is, in true Caribbean style, there is no rush or bother. The food comes out at a good speed but you're not rushed into ordering and it's just a great place to kick back and relax with friends. So that's exactly what we did. Still, eventually we decided Jerk Chicken Thighs, Spiced Sticky Ribs, Squid and Sweet Potato fries were the perfect afternoon nibbles to soak up some of the alcohol. The food was good and It hit the spot with the accompanying hot sauce for the Jerk Chicken and was the perfect pit stop before we headed back out into the hubbub of town! 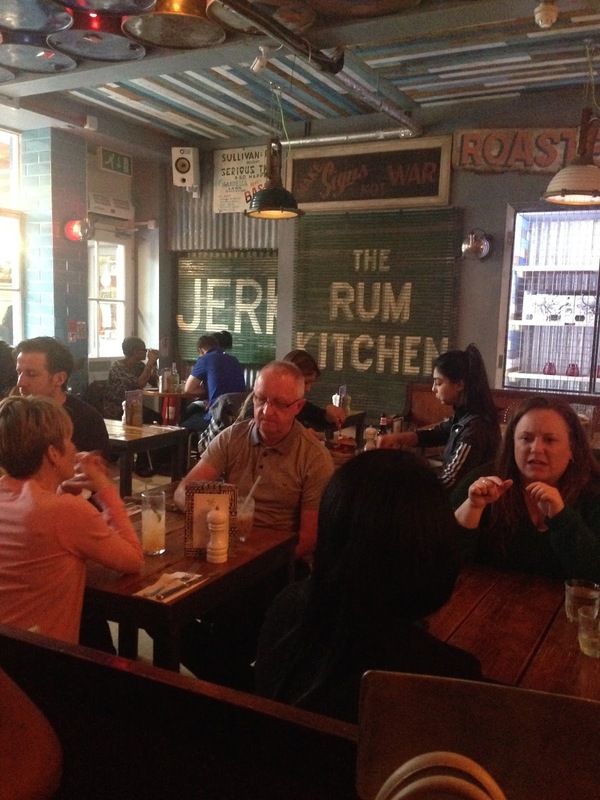 If you're after a fuss free spot with good food and even better drinks then Rum Kitchen is right up your street! Also, if you're a fan of this cuisine and are in and around Covent Garden, you should also check out Dub Jam, which is another great Caribbean shack spot.